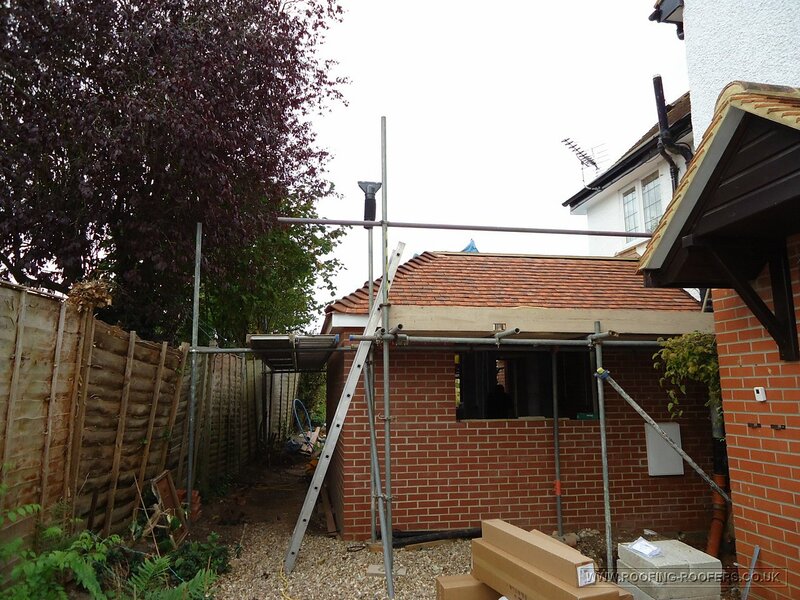 This was a single storey extension roof in Whitchurch near Woodcote. 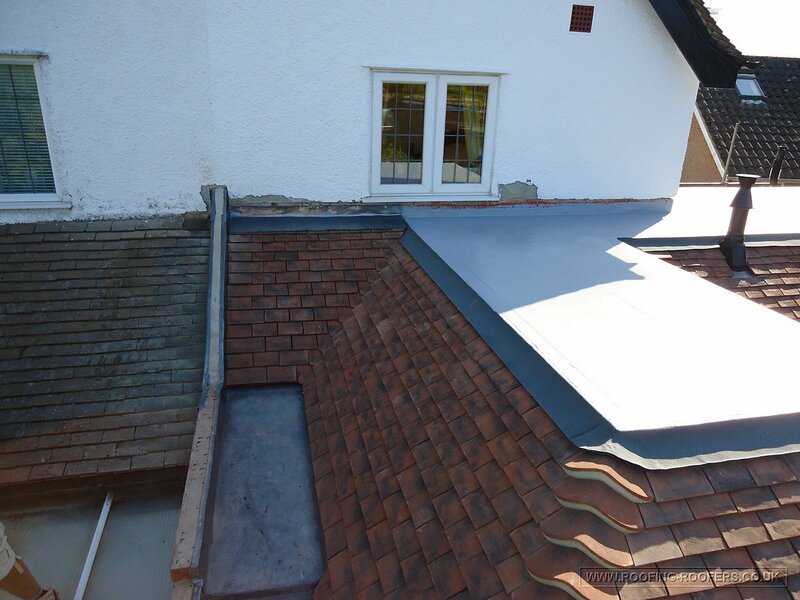 The job consisted of me doing a site visit for the building contractor and advising on quantities of materials and suggesting what system to put on the flat roof areas and in the gulley. 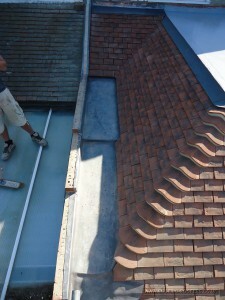 This shows the bonnets being laid and tiles cut in to suit. We are working our way across to meet the valley. Note there is a flat roof on top and a lower porch to engage. For a small extension the tiling work was quite intricate. 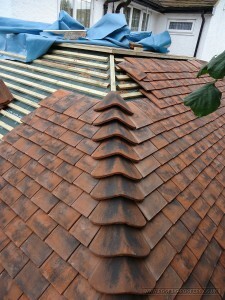 These are a handmade clay tile that are similar to an old clay peg tile. 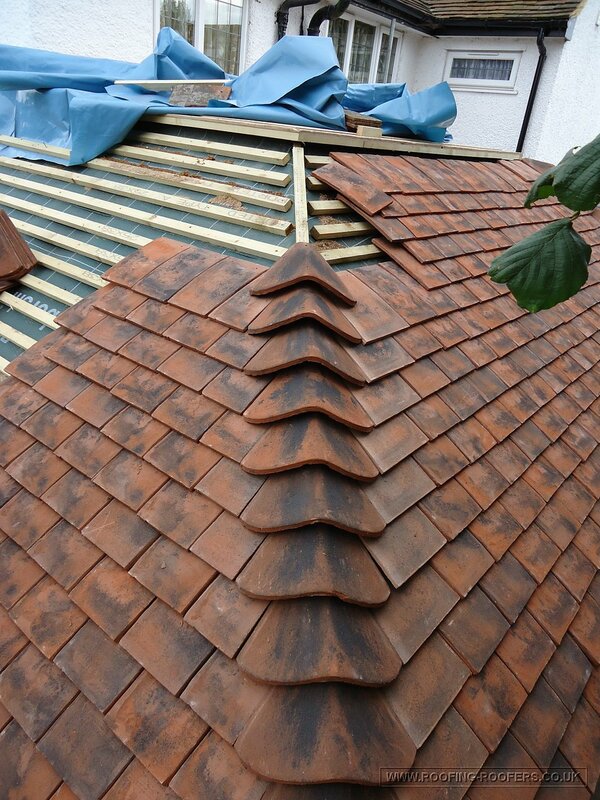 Once the felt was laid and the battens fixed and gauged to meet round at the same level on the hips and valleys, the tiles could be laid on to the battens and the bonnet tiles fitted so the tiles marry round at the same level. This gulley has been lined in code 5 lead and has been formed to have two steps in it to so the lead is in long enough pieces for expansion & contraction form various weather temperatures. 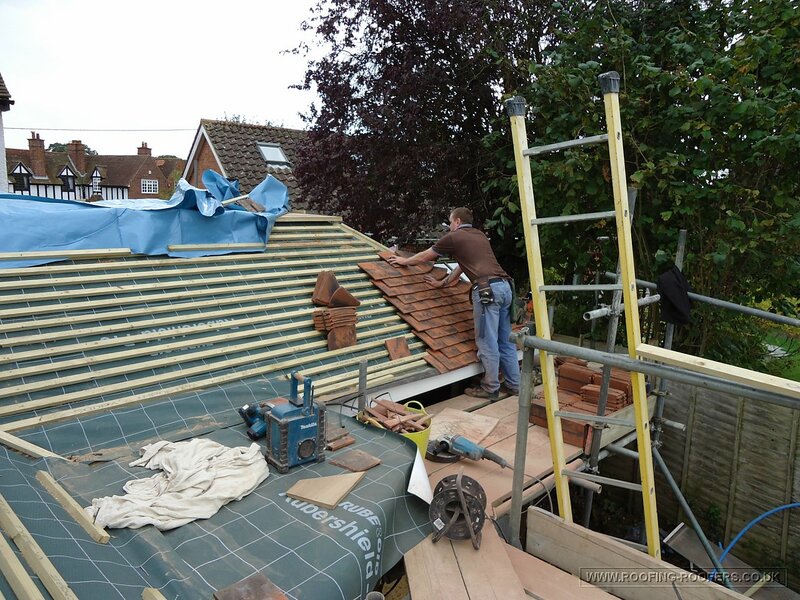 The lead is formed down on the ground first being bossed, cut & welded to suit the gulley width and roof angle and then it’s put into position on a geotech lined gulley to minimise abrasion on the timber. 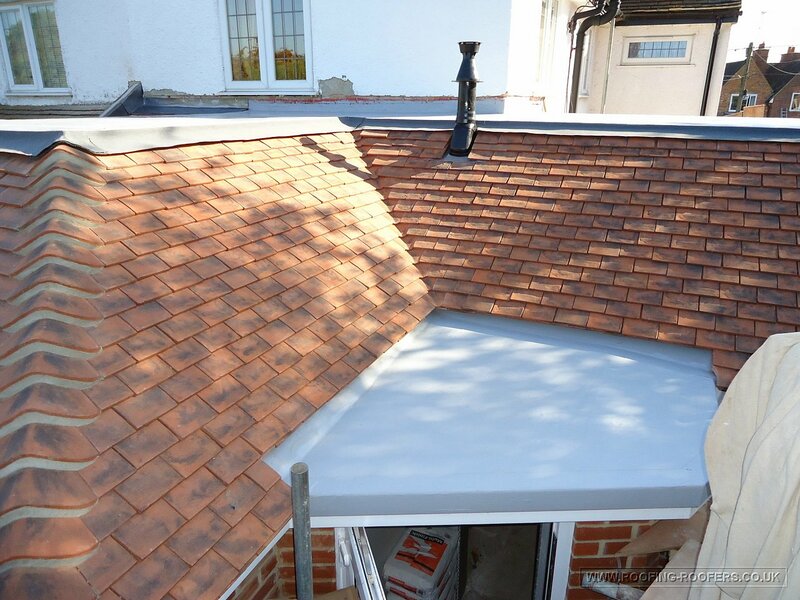 Doing it in the correct fashion minimises the stress on the lead reducing the risk of premature splits and failure to weatherproof the property. 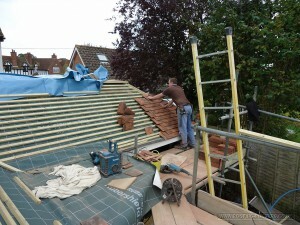 The extension roof was tiled and cut around the flat roof porch. 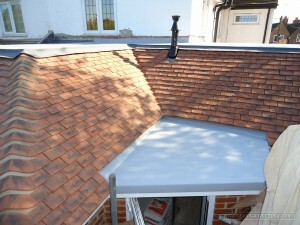 This porch has a sealoflex single ply membrane on it for durability and excellent weatherproofing properties. This entry was posted in Roof Tiling and Slating and tagged lead work, roof tiling by admin. Bookmark the permalink.